Q from William Raynor: Why is it that the nine countries around Sudan will not step in when they can see all of these refugees coming their way? If what you mean by “step in” is “why don’t they pressure Khartoum?” the answer is different for each of its neighbors. But the commonality across them is that short of an overthrow, they all have to continue relations with the regime that controls the state on their border. Making an enemy of your neighbor is never an easy course for a country to take – especially when that neighbor is more financially and politically powerful or – in the case of say Egypt – where your access to the Nile water that your population is dependent could be blocked by Khartoum. Nonetheless, Egypt, Ethiopia, Kenya and Uganda have all contributed troops to UNAMID (although whether troops from countries whose independence from Khartoum is compromised by their need for say, water, actually should be deployed as part of a force that has to be neutral is another question). There are also other ways of “stepping in” and not all of them helpful. President Deby’s regime in N’Djamena has entered the fray by supporting Darfuri rebels (although you’d be hard pushed to say they were motivated by the number of refugees crossing their border as opposed to Deby’s calculation that he needed to support his Zaghawa kinsfolk to stay in power himself). But in defense of the AU, they were getting a deployment on the ground while the UN Security Council was debating whether or not to refer the Darfur situation to the ICC. Through AMIS it was African nations that were the first to actually take action on Darfur – albeit under-resourced and under-mandated. Q from Michael Lucero: How can a two state solution be possible in Sudan when one of the largest points of contention is oil revenue distribution? If (and I do think it’s an “if”) Khartoum allows the south to have independence following the referendum then I think there’s a chance that in the short term at least, the fact that the oilfields are in the south, but the pipeline goes through the north (out to Port Sudan) creates a potentially useful mutual dependency. If the north wants oil, which it does, it has to have a working relationship with the new South Sudan state otherwise it can’t access that oil (unless it returns to war). If the south wants revenue from the oil, which it will, the new South Sudan also has to have a working relationship with the state on its northern border because of the route of the pipeline. Q from Carl Wilkens: Where do we get “snapshots” of student and other movements from countries around the world? Jerry spoke of how we are not alone! 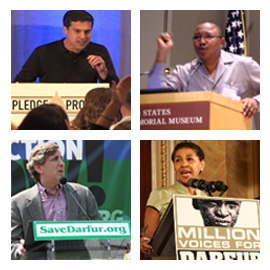 Check out the Darfur Consortium But I would also hand that question back to Jerry . . .
Q from anonymous: What is your feeling on the South becoming its own entity? Will it improve/worsen the situation? I am yet to meet a southerner who doesn’t want independence. I think the dream of a unified New Sudan died with Dr. John Garang. So in that sense my feeling is just, it’s their choice. The CPA gives them the right to vote for independence and that vote must be accepted as the final word on the issue. As to whether it will improve or worsen the situation, it’s impossible to say in the abstract. It will depend in large part on the way separation is achieved. If it’s an orderly process in which Khartoum (under international pressure) accepts what Scott Gartion refers to as “a civil divorce” then that obviously sets the new country off to a much better start than any alternative scenario. But regardless of the way separation occurs, the new state is going to require ENORMOUS support on every level. The interim period in the CPA was supposed to be used to build the infrastructure and capacity of the south and of the Government of South Sudan. But like so much of the CPA, this ideal has not been followed through on. So on every indicator you can think of, the south will be starting out with formidable challenges (although it’s worth pointing out that the people of the south are living with that lack of resources whether they are independent or not). The other thing that will be a risk, even under the most orderly of transitions, is that the support most southerners give the SPLA will dissipate once there is no longer a common enemy in Khartoum to unify against. There’s a hundred other issues related to the overall question. You might want to take a look at a report on this recently issued by USIP. I want to thank you for consistently sharing your opinions and the latest news from Sudan. Your commitment is inspiring.